For other uses, see Pressure point (disambiguation). It needs additional citations for verification. Tagged since February 2009. It may contain original research. Tagged since February 2009. A pressure point (Japanese: kyūsho 急所 ”vital point, tender spot”; Chinese: 穴位; Malayalam: മര്‍മ്മം marmam; Tamil: வர்மம் varmam) in the field of martial arts refers to an area on the human body that may produce significant pain or other effects when manipulated in a specific manner. Techniques of attacks on pressure points are called Hyol Do Bup (Hangul: 혈도법; 穴道法) in Korean martial arts, such as Hapkido, Sin Moo Hapkido, and Han Mu Do, and kyūsho-jutsu (Japanese: 急所術) in various styles of Japanese martial arts, such as Jujutsu, Aikido, Tenjin Shinyō-ryū, Daitō-ryū Aiki-jūjutsu, Kotō-ryū,Gōjū-ryū, Sekiguchi-ryū, Yōshin-ryū, Kuma-ryū, Kōga-ryū, Attsuuten-ryu kempo-jutsu, and Karate. There are several types of pressure points – each is applied differently and each creates a different effect. “Pain points”, for example, use tendons, ligaments, and muscles – the goal is to temporarily immobilize the target, or, at the very least, to distract them. Reflex points produce involuntary movements; for example, causing the hand to release its grip, the knees to buckle, the target to gag, or even for the person to be knocked unconscious. 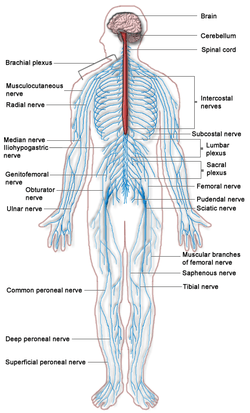 Most pressure points are located on pathways on the nervous system. The baroreceptors in the carotid artery are pressure-sensitive, supplying the brain with information to control systemic blood pressure. Pressure against this region will send signals that indicate that blood pressure is too high, leading to a lowering of blood pressure. There are certain areas which are likely to lead to a break if struck effectively, such as the “floating ribs“, the philtrum, and the side of the knee. Golgi organ strike, a relatively gentle strike to the Golgi tendon at the back of the elbow, which triggers a reflex that immediately relaxes the tendon, allowing the elbow to bend more easily in the wrong direction. If this is directly followed by a solid strike to the elbow joint, then the elbow can be broken with significantly less effort than it could through brute force. The brain is a sensitive organ which floats in a fluid (cerebrospinal fluid). The fluid itself is a safety mechanism that allows the head to take substantial impact without resulting in concussion, although such an impact could still cause permanent brain damage. However, it is possible to deliver a blow using artful techniques in such a way that even these protections can be effectively eliminated, causing disorientation or instantaneous knockout. The most commonly taught technique involves a strike just below the occipital ridge, at the correct angle, in the correct direction. Another well-known point with this effect is the chin or lower jaw, giving rise to the boxing expression a “glass jaw”. Some fighter artists[who?] believe that there are energy channels (acupuncture meridians) which allow Qi, or “life-force”, to flow through the body. Acupuncture, for example, is well-known among the practices that use the meridian system. Traditional Chinese medicine practices in general are largely based on the belief that meridians are specific pathway lines in the human body, along which are found many hundreds of acupressure points. According to this belief, attacks can be used to impact the flow of Qi, and, thus, the body. Therefore, pressing, seizing, or striking these points with specific intent and at certain angles is believed to cause either a heightening or a diminishing of Qi circulation in the body.